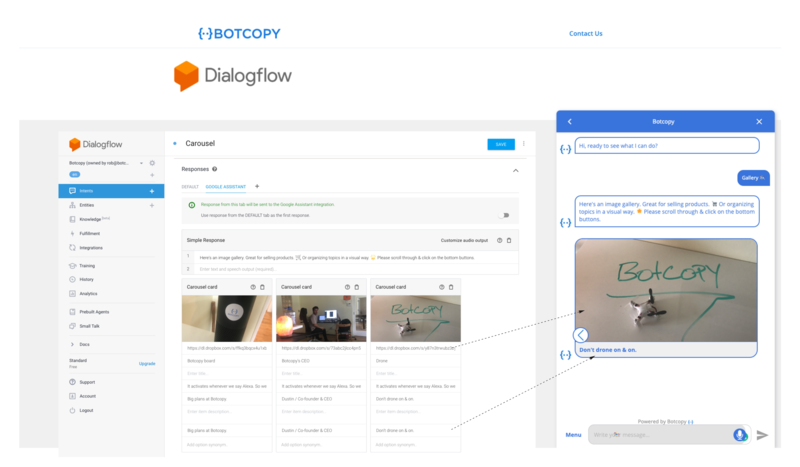 Welcome to Botcopy! The following is to familiarize you with the Google Assistant responses that work with Botcopy. 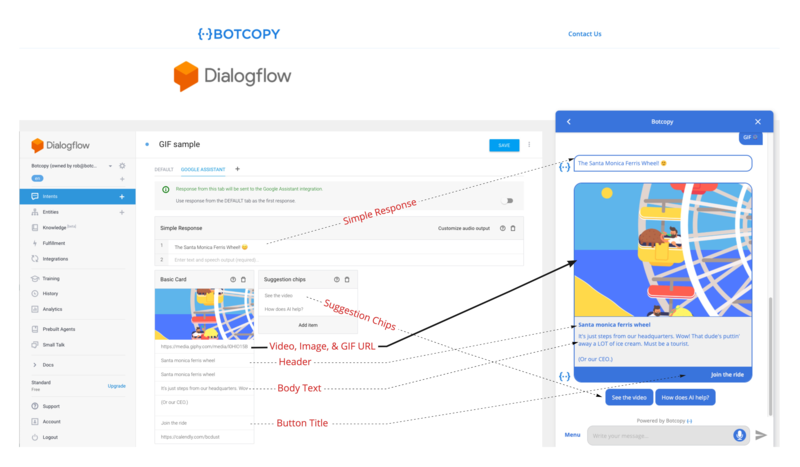 Naturally, Google also offers ample documentation on Dialogflow and Google Assistant. If you get stuck, please don't hesitate to get in touch with us. A simple response displays as a regular text file triggered from a users intent. If you would like to add buttons to this text add a new response type 'suggestion chips'. Suggestion chips are quick replies. Add them strategically to help your customers navigate your chat more easily. Basic cards can be used for images, gifs, videos and files by placing the url in the image URL field. Cards typically contain a title, text, and a button. If placing a video, please put .mp4 at the end of your url. Use carousel cards to display images in a gallery format. Doesn't support video files. Title and subtitle fields: Google has not fully released these fields from this component. Use Item title and Item description instead. For a carousel with selections that link to web pages, a browsing carousel is recommended. These cards are designed for your users to leave the chat to another browser. Opposed to Carousel cards which are designed to help continue the conversation. We should have Browsing Carousel response types setup in the next few weeks. Shoot us an email at hello@botocpy.com if you need them for a deadline sooner. Happy to help. List responses that work with Botcopy are currently being built. ⚙ They'll be here soon! Check out our custom payloads for workarounds. Subtitle: We do support it but it won't display as google has not released this. Once google releases this field of the component it will then display in your web chat. Media content was designed primarily for audio files. However, we are working on making them for images and video as well. Don't forget to convert the url to mp3 or mp4. If you'd like to send just the video, image or file without simple response or suggestion chips you can use a custom payload. Link out suggestions display a button linked with a url. If you don't want to be limited by Google's design rules, you can send us a custom payload of Google's json format of the same component. For example: if you'd like to send a card without a simple response preceding it, you can send a card as a custom payload. Warning: if your agent is also on Google assistant, Google assistant will not accept it. Please plan your conversations accordingly or you can use a clone for the web chat. 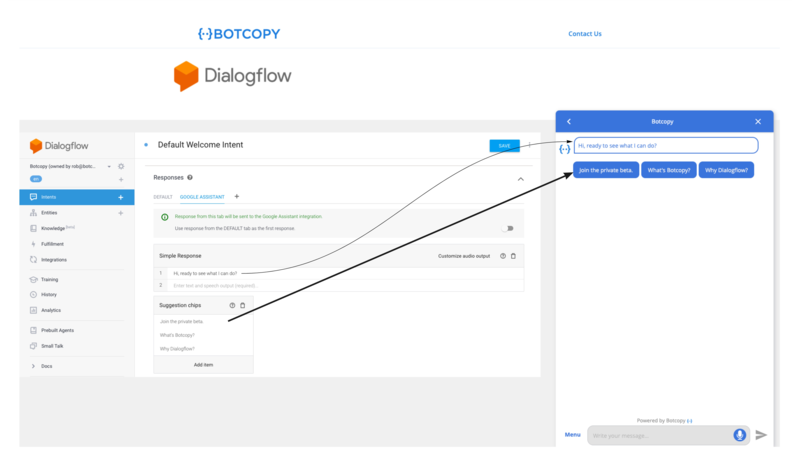 Botcopy has a built in integration with Chatbase and Dashbot. Just provide us your API key to link your account. 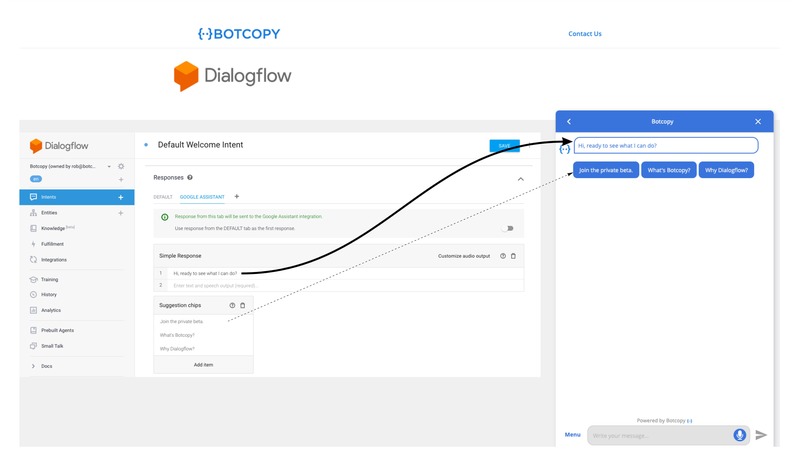 Bot prompts enable you to make your website conversational by setting triggers with Botcopy and building your prompts using Dialogflow. Simply set a trigger (unique training phrase or event) and a page url to add a bot prompt to a particular page. Additional triggers coming soon! Copy the generated embed snippet from the configure page on your portal.